If cinema as a celluloid form allowed us to meditate on the issue of scepticism, does the age of digital demand something closer to suspicion? This isn’t quite the question at the heart of D.N. Rodowick’s The Virtual Life of Film, but it is undeniably part of the problem as film moves from a chemical process to a mathematical one. Since so much film theory has been predicated on the indexical versus the iconic – on, loosely, film as a trace of reality, as opposed to its subjective re-enactment as in painting – then what sort of film theory do we need that takes into account recent technological developments, developments that will maybe make it more iconic than indexical? The idea for the book first came to Rodowick when he was asked whether he believed film studies would change if its object becomes digital and electronic rather than photographic, but perhaps the best way to read the book is to see it as preoccupied by a series of troubling questions that old style film theory may not always be best placed to answer. Whether Rodowick’s book – which is skimpy on film referencing, and perhaps too busy being logically precise rather than intuitively speculative – goes the right way about it is arguable. Tom Gunning, for one, disagrees “with some of its assumptions, methods and conclusions” (1). Rather than summarising these assumptions, methods and conclusions, we’ll look at a few of the possible lines of enquiry the book opens up. Maybe a renewal would work within the expected givens of the art form, and some of these renewals might be technical and others formal. The introduction of sound, of colour, of widescreen would be technological; the use of flashback, of the jump cut, of what Pier Paolo Pasolini called the free indirect point of view (where the director drifts from his character to create a meditative perspective beyond the immediacy of narrative), would be formal. None of them, however, cause problems for the specificity of the medium, no matter Rudolf Arnheim’s early claims that sound, for example, was somehow antithetical to film: “that something is not right there” (3). But is it not fairer to argue “that something is not right” about digital? However, many of these ethical stances surely come from viewers and creators, and some critics have apocalyptically and semi-jokingly suggested that there will be a backlash against the proliferating digital image. Jonathan Romney, in an article called “Million Dollar Graffiti”, proposes that “viewers will want guarantees that they are seeing reality itself, with a minimum of mediation and adulteration, and the more extreme the better.” (5) In this sense, celluloid itself will be like the equivalent of the long take, not just a formal demand but a technological one also. Will celluloid cinema carry the hallmark of quality wood, with digital film the equivalent of Formica? Or will some creators, like Godard, Rohmer and others, foreground a kind of ethical aesthetics, where the digital will not even pretend to be indexical and will thus point up its iconic status in the painterly uses to which it has been put – as in In Praise of Love and The Lady and the Duke? For one of the biggest problems for exponents of the pro-filmic, for the ontological reality of the image, is, of course, the invisibility of artificiality. “The deepest paradox of perceptual realism in the emergence of digital cinema”, Rodowick believes, “is its presentation of images that appear to be, and want to be ‘photographic’ only more so.” Stephen Prince, for example, in a key Film Quarterly article Rodowick utilises, addresses what sorts of problems this creates for film theory when he quotes both Bazin and Siegfried Kracauer and the degree to which their theories hinge on the “indexical status of the photographic sign” (6). When we are dealing with the visibility of artificiality – like dinosaurs in Jurassic Park (Steven Spielberg, 1993), spaceships and the destruction of the Empire State Building in Independence Day (Roland Emmerich, 1996) – this isn’t especially a problem for film theory or our perceptual faculties. But what about the invisible? What will happen when the technology is so advanced that it will be difficult to distinguish between George Clooney and his “synthespian” equivalent? Will this result in a cinematic version of the picture of Dorian Gray, with Clooney freeze-framed at a certain point in his career and the synthespian Clooney making film after film, while the aging Clooney puts his feet up and basks by the swimming pool, entering slothful early retirement? How much film theory will fall apart as the digital, in all its manifestations, takes over? These are questions that lurk within Rodowick’s text but are maybe too rarely confronted. He is more concerned with a detailed analysis of the photographic than speculating especially over the digital, and it is a point Gunning makes when he says, compared to his detailing of the photographic, “[Rodowick’s] description of digital cinema, valuable as it may be in raising questions, seems to me to lack such depth.” (7) More could have been made of the shift from the sceptical aspect of the photographic – where Bazin and Kracauer still needed to defend the pro-filmic against more formally driven writers like Arnheim and Sergei Eisenstein – to the suspicion required in relation to the digital. For the more invisible the digital effect, the more the need for a suspicious as opposed to a sceptical film theory. Now even if we assume this need for authenticity in the image is a throwback to Bazinian film theory, and that we should be leaving it behind for intensity of affect, can we readily extricate our feelings from what we perceive our feelings to be responding to? Part of the pleasure in cinema resides in the passing present of film, in knowing that the film is simultaneously fictional exploration and documentative examination: as Serge Daney once said, a good film should contain the history of its making in the viewing experience. Was one of the problems many critics had with a film like Le Fabuleux destin d’Amélie Poulain (Amelie, Jean-Pierre Jeunet, 2001) the degree to which one felt that history was masked over, contained by a hyper-realist aesthetic? Will “film”, the more digital it becomes, allow the digitally hyper to replace the celluloid real? And will this be a problem even in films that would seem to be closer to aesthetic high mindedness than hyper-real pragmatics? For all Rodowick’s technological detail and logical precision when addressing what he perceives are the limitations of Russian Ark, nothing quite strikes the viewer so deeply as when he says “recorded on December 2001 after three false starts, Russian Ark is a work captured in one go, as it were.” Compare this to a celluloid masterpiece like Im Lauf der Zeit (Kings of the Road, Wim Wenders, 1976) (which translates from the German as “In the Course of Time”) and the opening statement explaining it was “shot in 11 weeks, from July 1st to October 31st, 1975, between Lüneberg and Hof along the East German border.” Wenders decided to make Kings of the Road “a travelling film where I could put in anything I liked, where I would have the freedom of making up the story as we – literally – went along.” (8) This is an ontology of authenticity, and while we might sceptically muse over exactly how authentic this film experience might be, and how close to reality Wenders manages to get, it is part of an ongoing epistemological debate. If Rodowick and others feel that Russian Ark is a masterful work and yet at the same time somehow a failure in cinematic duration, it again resides not only in the technology, but in a broader ontology where the long take isn’t enough. Wenders’ film takes place over six and a half days, yet the cast and crew spent four months getting those six and a half days of diegetic time. We can think here not only of the duration of the digital shot (which Russian Ark achieves stunningly), but also the duration of the celluloid shoot. It returns us to Rodowick’s question of the difficulty of capturing duration on digital, but this is a multi-faceted problem that requires much affective singularity, speculative probing and a close look at numerous films from both the celluloid and digital eras. Rodowick’s book opens up the debate, and whatever his reservations this is hardly a work of scaremongering apocalyptic despair. As he says at the end of it, “Screen, film, spectator, image, movement and time… the form and vocabulary in which these questions are posed has changed continuously in the history of film theory as a series of conflictual debates”; yet, as he adds, “the basic set of concepts has remained remarkably consistent.” (p.188) Maybe what we need to hold on to more than anything else though, as technology changes, is the capacity to think sceptically – to think through the specific problems as they occur – without giving ourselves over to suspicion (it’s all fake), or gullibility (it’s all grist to the affectivity mill). What we need are more philosophers and critics like Rodowick, but also thinkers giving themselves over to the minutiae as well as the abstract. Rodowick’s abstractions are helpful, but, finally, only really conjunctionally useful – allied to more specific critical examples. 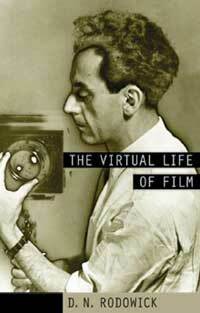 The Virtual Life of Film, by D.N. Rodowick, Harvard University Press, Cambridge and London, 2007. Tom Gunning, “The Sum of Its Pixels”, Film Comment, September-October, 2007, p.78. Stanley Cavell, The World Viewed: Reflections on the Ontology of Film, Viking Press, London, 1971. Rudolf Arnheim, Film as Art, Faber and Faber, 1983, London, p.164. Roland Barthes, Camera Lucida: Reflections on Photography, trans. Richard Howard, Flamingo, London, 1984, p.96. Jonathan Romney, Short Orders: Film Writing, Serpent’s Tail, London, 1997, p.223. Stephen Prince, “True Lies: Perceptual Realism, Digital Images, and Film Theory”, in Brian Henderson and Ann Martin (eds), Film Quarterly: Forty Years – A Selection, University of California Press, Berkeley and Los Angeles, 1999, p.395. Wim Wenders, The Logic of Images: Essays and Conversations, trans. Michael Hofmann, Faber and Faber, London, 1992, p.13.